Chop onion, green chillies and coriander in food processor and add it to the mincemeat. Add all the spices as well and mix well with hands. Give a pulse in food processor for 5 seconds and keep aside for 10 minutes for resting. Grease your hands and shape the meat in seekh kebabs by either rolling it on the skewer or back of the spoon. Heat oil in frying pan and shallow fry the kebabs just to give a shape (half cook). In a separate pan saute garlic paste with no oil and add cream. Now gently transfer half cooked kebabs to this cream mixture and let it cook for 5 minutes or until fully cooked. Temper it with coal and serve hot. I love soups, specially Asian inspired, not a big fan of vegetable puree soups. Chicken corn soup, Cream of chicken, Cream of Mushrooms, 19B, Thai soup, Wonton Soup, Tom Yum & Hot n Sour are my top favorite and luckily in Melbourne I find all of them and I know how to make them all at home as well which never makes me feel Soup Deprived 😀 . No matter its hot or cold, I can eat soup in any weather, in any season with same love. My love for soup is endless 😀 😀 😀 😀 Alrighty, enough of my love for soup. 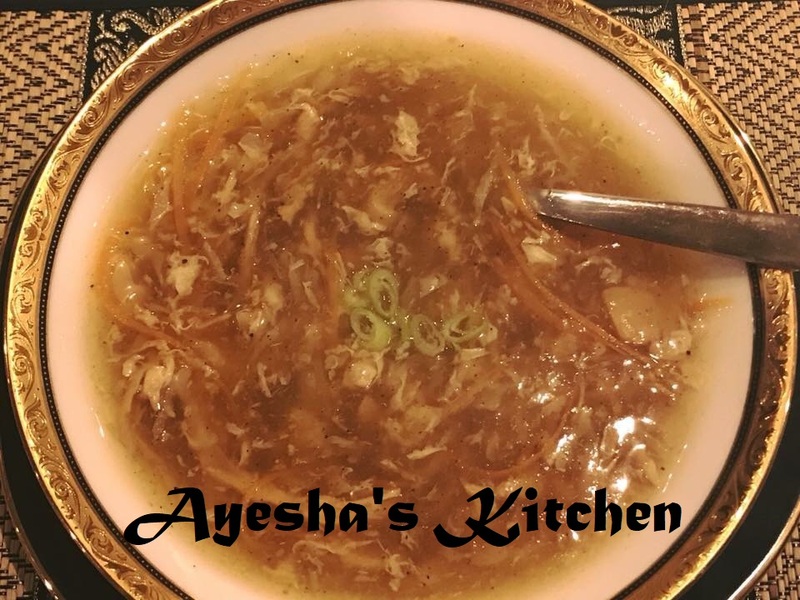 I will tell you about this soup, It is not Chinese authentically, but it is Chinese inspired Pakistani Soup, available at all Chinese food outlets and very famous in Pakistani Home cooking. Very ideal for weight loss and keeps you full for longer. Boil chicken in 12 cups of water with salt, pepper and Chinese salt. Take out the chicken and keep the stock boiling on low flame. Shred the chicken with your hands when it cools down and add it back to the stock. Cook for 5 minutes on medium heat. Add the veggies and boil for 2 minutes and add the sauces. Cook for 5 minutes and add the corn flour slurry with constant stirring to thicken the soup. Now add beaten eggs with constant stirring otherwise it will make one giant egg in the soup. Cook for 5 minutes. Adjust the salt, pepper and sourness of the soup by adding everything to your desire. Bong Paaye is a famous dish of Pakistan’s Punjab province. It is our Prime Minister, Mian Nawaz Sharif’s favourite breakfast as well and a very rich delicacy of Eid al Adha. For masala, pan roast cumin, nigella, coriander, peppercorns, cloves and cardamom for 2 minutes. Put all of it in spice grinder and make powder. Take 10 -12 cups of water, add salt, ginger garlic paste, salt and hooves and boil for 4 hours. Add more water if needed. Now add beef pieces and cook covered for 4 more hours or until the beef is tender. Heat oil in a separate pan and add all the spices in it. Add yogurt and mix well. Don’t let the spices burn. Add this mixture to paya and cook on low heat for further 30 minutes or until the oil comes to the surface. 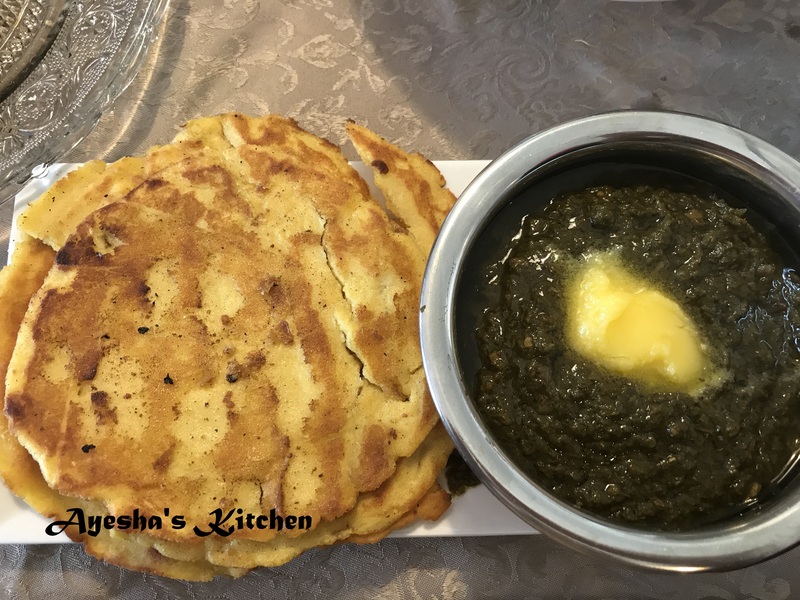 Makki ki roti and Sasron ka saag is one of the famous dishes of Punjab and it depicts the agricultural culture of this Province, famous both in Pakistan and India. 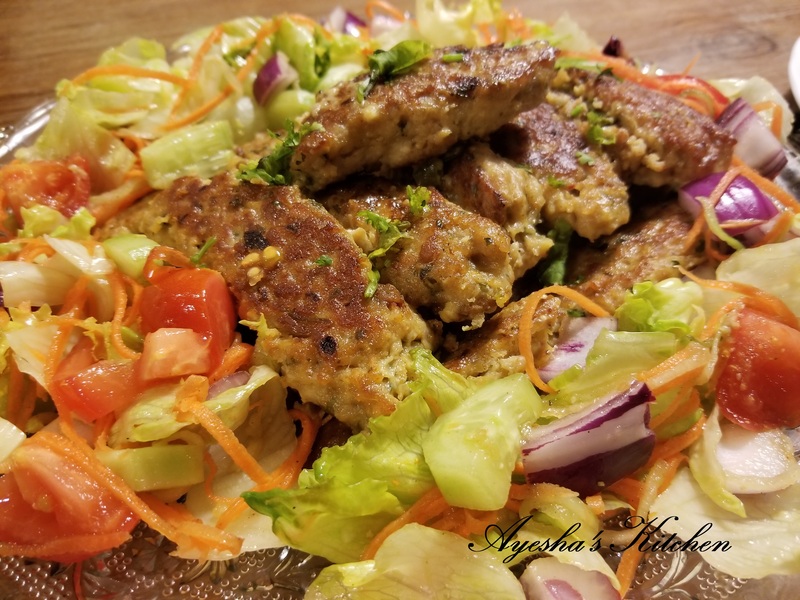 The best thing about this dish is that it is not confined or related to only one time meal, you can serve it in breakfast, lunch, dinner, snacks or anytime 🙂 I didnt know how to make it first and I used to think it as a very difficult but love (for food) made it easy for me, so here is the recipe for you …. Wash and clean and cut all the greens. Wash them in open and wide container under cold water to get rid of all the sand and soil and put in a colander to drain. Boil 2 litres of water in a deep pot and add the greens, garlic cloves, salt and green chillies. Cook covered for 20 minutes and drain the access water. Keep the boiled greens in the colander for 15 minutes to remove all the excess water and cool down. Grind it in a food processor to coarse. Now if you want to use it later, you can make 2 packets and freeze for up to 60 days. Or if you want to cook it straight away, melt ghee is a cooking pot and fry chopped onion until its translucent. Add ginger and garlic paste and fry until it is golden brown. Add saag puree and cook until the water evaporates and ghee starts to separate. Add chopped green chillies and take it out in a dish. Take 3 cups of makki aata in a deep bowl and gradually knead it by adding little warm water at a time. The texture will look like wet or kinetic sand, not like normal flour dough. Knead it for 5 minutes and keep aside for 20 – 30 minutes at room temperature. The best thing about this dough is it will not stick to your hands but still grease your hands a bit just to give it an even shape. Make 3 – 4 round balls of this dough. Spread some aluminum foil on your kitchen bench top (flat surface) and make round roti or chapatti on it by using your palm and fingers. The roti will not be even or flat as normal roti and it will break if you make it on hand, that’s why we are using aluminum foil. Heat tawa or flat pan or griddle and very carefully put the roti along with the foil on the tawa with roti facing the tawa. Gently peel off the foil. Drizzle some ghee or oil on the sides of the roti so it does not stick to the pan. After 1 minute, very carefully turn the roti with flipping spoon and apply ghee on the other side. 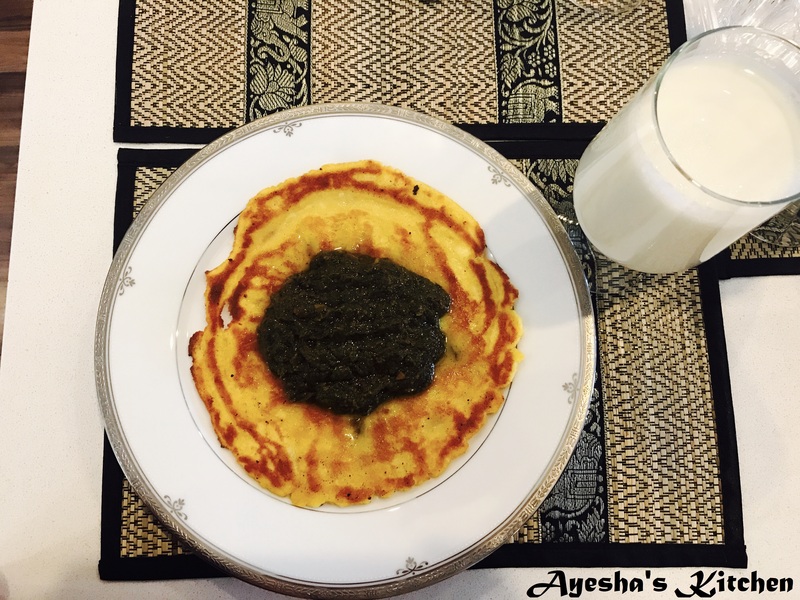 When the roti is brown and cooked, serve hot with saag and white homemade butter. Egg bhurji is inspired by South Asian cuisine. They add spices in everything man! I never tried this just because my mind was not accepting the idea of having too much spices in the egg for breakfast but then I tried a cheese omelette at one of my best friend’s home where she put cumin and coriander in it and OMG Yessss! it was great. So from there I got inspired to try this at home and it came out so perfect. 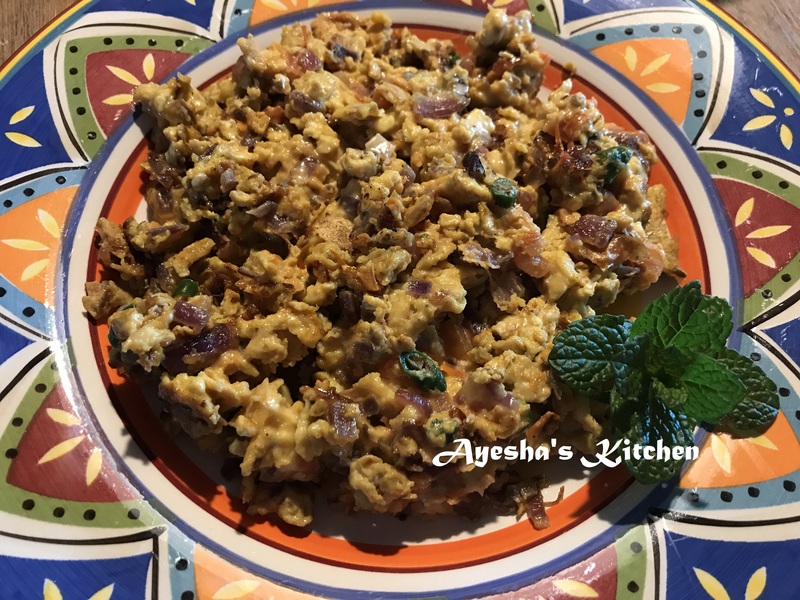 Here is the recipe for you, if you are traumatised by the idea of having all the spices in egg, believe me its not bad at all, go with my believe and try this ❤ I am sure you will love it! Wash and chop all the veggies. Crack 6 eggs in a bowl, add salt, spices, milk, mint and coriander leaves and whisk. Melt some butter in a pan or heat some oil. Add onion and cook until its translucent. Add tomato and cook until tomato loses the stiffness and then add green chillies and mix. Add egg mixture and let it sit for 1 minute in the pan to let it cook from the bottom until we scramble it. Add some cheese at this stage if you want to otherwise mix and scramble the egg. DO NOT OVERCOOK. Keep it moist and take it out in a plate. Serve with light rye toasts and enjoy. 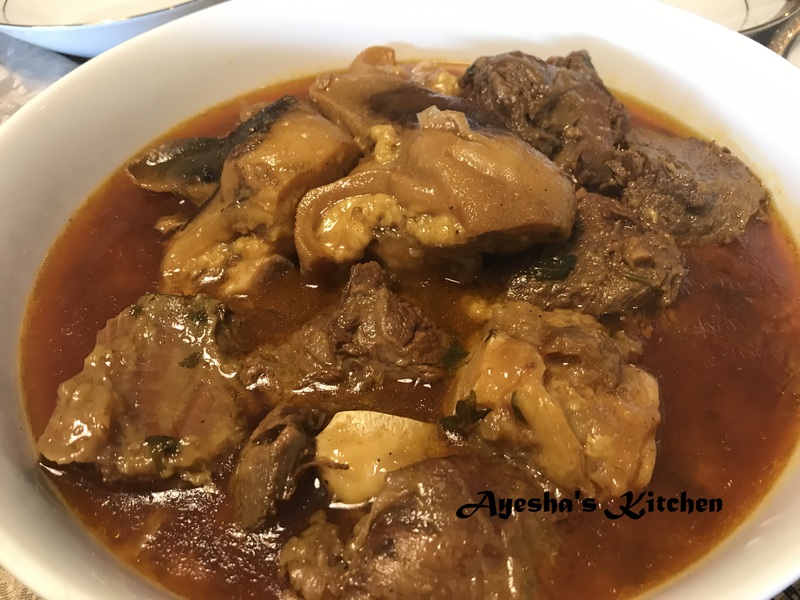 Chicken Paalak….. one of the famous dishes in Pakistani home cooking but not everyone knows how to make the best one. Everyone knows how to make it but some people know how to make the best one. 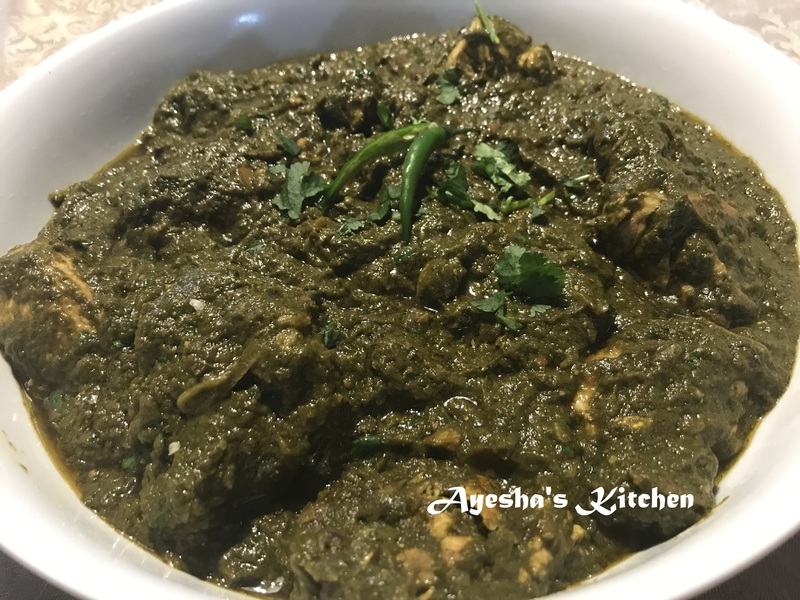 This is my recipe and it is the best one 😀 I don’t like the spinach smelling too much like spinach so I add fenugreek to it, they go hand in hand, perfect match made in desi food heaven and a key to make everyone like spinach and ghee…. desi ghee, clarified butter. It gives a desi flavor boost to Paalak (spinach) and a very rice and tempting look as well. 1 chicken, 1.5 kilos, cut into 16 pcs. Heat oil in a pan and add cardamom, cinnamon and cumin. When they begin to crackle add onion and fry until they get brown. Add ginger and garlic, fry for a minute and add chicken. Fry until the chicken gets a golden color and add tomatoes and all the spices. Cook on high flame until the tomatoes are loose. Reduce the heat and cook covered until the chicken is 90% cooked. Meanwhile get everything given for Spinach in the food processor and grind it into a paste (medium coarse to fine). Add it in the chicken curry when chicken is ready and mix. Let it cook until the oil starts separating. Add 1 dollop of ghee for flavor and some green chillies and serve hot with rotis.